In Lindsey, Lincs, 650 workers have been sacked for being on an “unofficial” strike (whatever that means in a land of freedom, fit for heroes). The actual cause of the strike goes back many months…. Personally, I believe the workers. 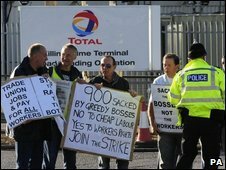 The root of the problem is that Total is a French company employing contracted labour on it’s British sites. And, as we know, a Frenchman’s word is not binding – they’re more like guidelines actually, hence it’s usage in Shakespeare’s play. An Englishman’s word is supposed to be more binding, but, like the MP signatures at the bottom of their expense claim forms, not as binding as you’d think (more of this in a later post). The irony of it all is that Total, in France, could never, ever, behave in the way they have done here. French employment and labour laws are much stricter than here in the UK. The UK Industrial bosses and generally Tory voting management teams will always trumpet the clarion call that “we need flexible working to allow maximum productivity” or words to this effect. The absolute irony of it all is that productivity in France is much higher than here in the UK. This is despite the 35 hour week and holidays every fifth week and for every saint’s day etc. The extra irony is that because the French companies are more productive and thus “fit”, they are more profitable, have more spare cash and thus have bought up virtually every utility in Britain!